John Corabi is a frontman and guitarist with a vast resume. The rock ‘n’ roll world has held on tightly to this guy—an artist well known for his collaborations that deliver time and time again, and it’s no wonder when you hear what he’s capable of. 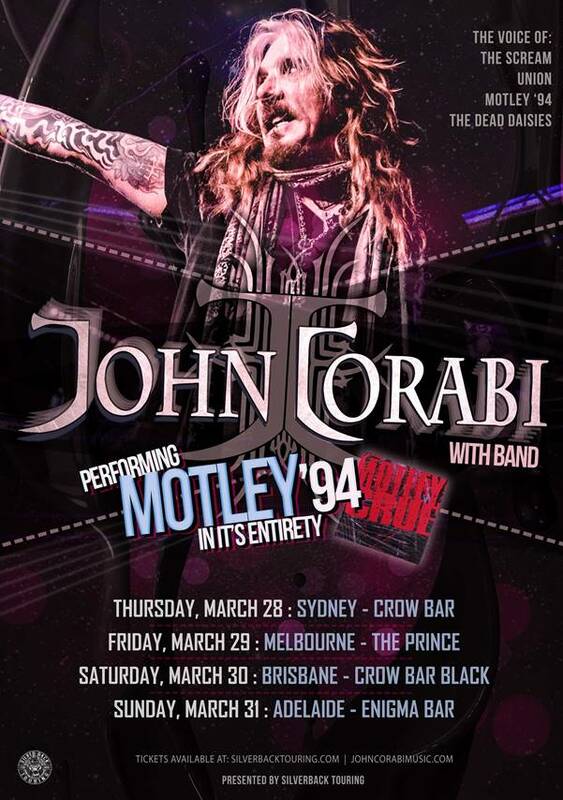 25 years ago, Mötley Crüe released their self-titled album, Motley ’94 during the period when John Corabi was the band’s lead vocalist, and he’s heading our way to celebrate the anniversary, with his first ever solo tour later this month. And whilst we’re journeying back into the past with him and his current band The Dead Daisies, we thought we’d revisit five interesting things about John Corabi that you may not know. For more than four decades John Corabi has been in the heart and centre of all things rock ‘n’ roll. A hard rock singer and guitarist with a ragged edge, he’s also no stranger to the pop-metal scene, having worked with bands such as Angora, The Scream, Mötley Crüe, Union, ESP (Eric Singer Project)—and that’s only naming a few! Have you ever heard the vicious rumour that rock ‘n’ roll is dead? John Corabi puts that entire argument to rest when you reflect upon his recent work with current American/Australian hard rock band, The Dead Daisies. These guys have hit the stage… well, rocking! Since their 2013 conception in Sydney, Australia, they’ve released four studio albums plus one live recording, a solid effort over such a short span. If time is money, John Corabi is more generous than most. He’s all about fan-pleasing and felt inspired to launch what the band call DaisyLand: an initiative that encourages their followers to get involved, whether it be through frequent signing opportunities, meet–and–greets or competitions that reward their most loyal fans. For example, DaisyLand Acoustic Sessions is an opportunity for the first 50 in line at select shows to attend an exclusive acoustic set before doors open for everyone. In February 2015, still early in the band’s professional career, The Dead Daisies made history when they were the first rock band to play in Cuba when heavy restrictions around US-Cuba trade ties were starting to ease. The guys spent a week in Cuba, famous for its musically rich culture, while media press kept a watchful eye. Performing at a sold-out show at Havana’s Maxim Rock Club and wrapping up their stay with an unforgettable performance at the Concert for Peace (Roc Por La Paz). Significant attention, worldwide respect and praise followed. It’s not commonplace for artists these days to create an authentic rapport with their fan-base. John Corabi’s presence via social media is a refreshing change from the same ol’, same ol’ we’re so used to seeing on Facebook and Instagram. John Corabi is a guy who shares because he cares to do so—posting about what’s happening in his world with personality, humour, lots of beautifully scenic photos and all in a style that makes you feel included and appreciated for following him and the awesome music journey he’s been on. Don’t miss out—tickets are selling fast!